Re: The 2017 World Cup - The Stories. Yes! Friday dinner venue and food was the best I had experienced. And Saturday at the venue was something very special. To continue playing friendlies with drink and pizza into the late night with dear friends was what makes this whole thing worthwhile. The banter, the teasing, the battles, the laughter - love it! We must make this Saturday night KO2 a mandatory part of all future WCs! About time I did a write-up me thinks. We arrived in Copenhagen on Weds to get some sightseeing done... we had a great time there, doing a tour bus, going to tivoli gardens and meeting up with me old mate Jorn on Thursday for some lunch. The travel to Landskrona was nice and simple and we were very pleased with the hotel. We went out to get some snacks n beer and had a quick scout around the area. Then it was time to meet everyone at the restaurant. The company and the food were fantastic! However, all I could think about was getting to the WC venue and get started! But first, some shenanigans in Peter & Michael's room with and Amiga! That was a fun night! Jorn threw a huge spanner in the works by beating John, who'd already beaten me, so it was a 3way struggle for the 3rd and 4th spot... it came down to a very tense game with Jorn but I managed to find a way past the peoples lockout this year and progressed... then was presented with a TPL t-shirt to commemorate the occasion! Sunday... it was never gonna be too much fun for a minnow in there, but I managed to get 2 wins in the group and a very close one vs Camber (last kick lob winner... AGAIN!!)... but for me, it was mission accomplished, I got there and didn't do too badly amongst that company, finishing in 14th. On the whole though, it was a brilliant world cup, it was great to chat with John more this time, thanks for those cigars mate, was a pleasure to get to know you a bit more! Had an absolute blast with the Germans as usual, especially the goalkeeper subbing with Michael, I thought i was gonna pass out from laughing! Just sitting in the stands with Andy was great too, I could never have enough time with you mate! Huge kudos to Torgny, Jacob and Jorn for a quality venue and great organisation! Best thing for me though was that I could share it all with my best friend Jayne. Well done BoIS, great video Torgny and Jappz, those are cracking goals! So, my weekend: I touched down in Copenhagen at 6pm Friday, and with the help of organisers' documents, it was an easy train to Landskrona and walk to the hotel where I found 30 friendly faces just about to leave for the restaurant - too many to greet at once! Had a great steak and met Frank and Petra who described to me Schwabian Spätzle, and I explained to them (and Andy!) what a barmcake was. Loved the ceremony of the draw, and the Kinder eggs. Then it was off to a great bar for more Erdinger, I had a good catch up with Jørn and Cornelius and many more. I was hugely tempted to join Andy's invitation to clubbing but saved myself from a hangover at the last second by settling instead for stealing one of Robert's chillis in the kebab shop. The layout of the venue in the morning was excellent - a dozen Amigas ready to go, one of them being beamed around the world, and plenty of space, chairs and drinks. I started with unsurprising nine-goal destructions from Thor (who lobbed me at 7-2!) and Chris, before coming to the important games. 2-1 defeats by Jørn and John were bittersweet, better than I expected, yet twice I agonisingly lost out to a late winner. Lee has moved beyond me in technique and saw me off 7-3, but thankfully I held my nerves to beat Thomas and Torgny, to finish 6th. My silver group started with a 7-0 lesson in finishing from Michael, but soon improved with big victories against Cornelius and Peter S - my mind must have been in the zone, I can't remember anything about them - and the day ended with my most pleasing result, a narrow victory over Michele, it felt like a game of Speedball 2, I was physically drained at the end. It was great staying in the venue with beer and pizza. I had a great long chat about all sorts with Stephan, the German journalist, and I'm looking forward to reading his article on the event. Can someone explain to me why Guido Buchwald touches concrete? Oliver described being up Georgian mountains in the morning and being on the beach in the afternoon, and Lee and his friends were very generous with some top quality vodka, until Jacob politely turned off all the lights to remind us at midnight to go home. On Sunday I faced Dennis, who repeatedly caught me out on the break, but a I secured the top four place I wanted with an end-to-end victory over Jaume, bringing a silver quarter-final against Paolo. He is too strong, dominating midfield, and could have had more, but my tournament finished well as I took 21st with aggregate victories over Dennis and Michael. Group G and the knockout were what I enjoy most - games where everyone is capable of beating everyone, where we can lose to people 7-0 and 5-1 one day, but come back the next and reverse the result. The hotel was amazingly good value, especially the breakfast - I've been to hotels three times the price that didn't have that spread. I got to walk around the castle and see some typically Scandanavian sights - a children's play area with instructions, and a skateboard park with no graffiti. Sunday also brought a chance to talk news and opinions from across Europe; I enjoyed learning Rodolfo and Jaume's takes on Catalonia, and giving my view on Brexit to Thomas. Many thanks to Jørn, Jacob, Torgny, Jappz and all the others for putting together a brilliant weekend; it was better than Christmas. Thanks to Gianni for keeping the tournament to time so I was able to finish my games before my flight home. And thanks to the Germans for travelling in great numbers and in great spirit, giving me my fondest memory of a three man hug (Thomas, Peter and Michael maybe? ), to try and prevent me from going home. It was an accident. My joystick slipped. I swear! I've added links to the few pictures I managed to take in my first post. Please, add your pictures as well. I really miss both reading your stories and looking at pictures from the Weekend. Thanks, Jorn! The photos really capture the spirit of that fantastic weekend! Excellent photos. Who caused so many people to put their hands in the air in the last photo? Cheers Ian. I think that picture must be from the Game Of Shame, or the qualification-match for the GOS. As you know, we had a German journalist as visitor at the WorldCup. Last weekend the new issue of "11 Freunde" https://www.11freunde.de/ came out - with our article covering the tournament in it. 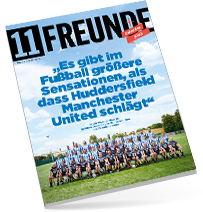 Title reads: "There are bigger sensations in football than Huddersfield beating Manchester United." I scanned the pages and tried to translate it for everybody to enjoy reading it - even if you don't speak German. Fantastic work Frank! Thank you very much. A fun read and a bit emotional.